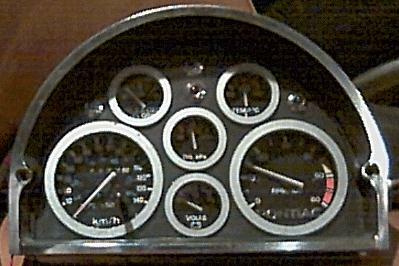 I was scrounging around the wreckers, looking for late model factory gauge packages and came across a 1983 Olds Cutlass wagon with a complete gauge package in it: 0-6000 rpm Tach, 0-140 kmh speedometer, voltmeter, fuel gauge, temperature and oil gauge. It was strange to see in a family wagon with fake wood paneling on the side. Since I live in Canada, the speedo and oil pressure are in metric units but I'm sure the same gauges exist in the States in British units. 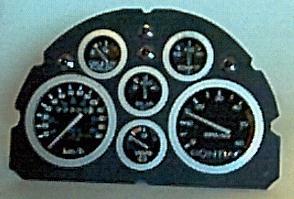 What is really nice about these gauges besides costing only $22 for the set is that they are small. 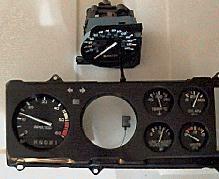 The tach and speedo are 3" in diameter and the auxilary gauges are only 1 1/2" in diameter. This means that with a minimum of fuss (famous last words!) they should be able to fit into the existing opening in the dash. 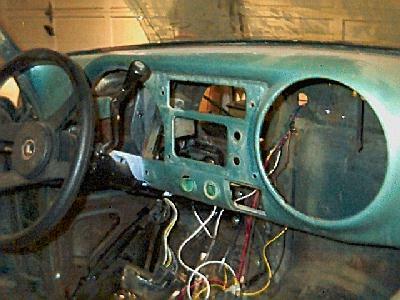 Here's the layout after disassembling the dash package, notice the PRND21 on the tach! A really neat feature which should solve a lot of problems for some people is the PRND21 indicator that's on the bottom of the tach. It is connected to the steering column shifter by a clip. Incredibly simple and it is also detachable for those who don't need to use it like me. 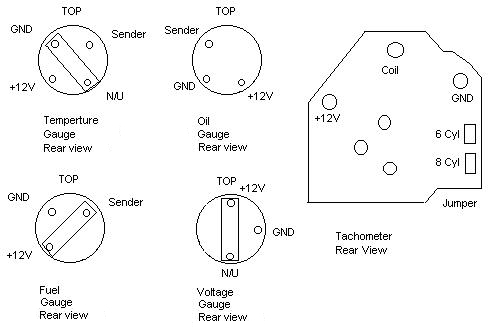 If you need to check if the tach is working properly, go to the How to Test Your Tach page. The plastic on the gauges looks all cracked but it was just dirty. Here's the dash minus the doo dahs. After I cleaned up the dash and stripped it down. I was thinking that the dash could be cut along the curved lines and a factory gauge cluster that had a round shape could be made to fit. I would have to spend a while at the wreckers to find something that would work. Just a thought for something to do later after the car has been on the road for a while. I decided to use the original trim ring even though I didn't like the idea of cutting up a perfectly good trim ring. I investigated the work required to make my own and decided it wasn't worth it. I have two complete gauge sets, with one missing its frame if any one is interested. I used a die grinder to cut out the center cross piece and filled the cross pieces holes with JB Weld. I've started to contour the JB Weld to the final size that I want. The gauges are a very tight fit and I'll need a lot of work down between the larger 3" gauges and the frame. The outside edge of the frame is chrome and the inside has a textured black finish. I have green leds for the turn signal lights, a blue led for the hi beams and a red led for the brake light. The LEDs fit in jeweled lenses with chrome rings so that they look pretty. The holes haven't been drilled in the gauge panel yet. 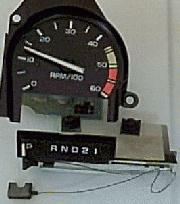 I've decided not to use the PRND21 that comes with the tach and replace it with a Pontiac logo or something. I already have the PRND21 on the column and it works. So rather than make more work for me, I've decided to go on to something else. I tried to keep the wiring neat but it sure doesn't look it! One of my concerns with making a gauge set like this is if it will stay together. The gauges are glued in place with JB Weld and I should of used a heavier gauge for the front panel. The light gauge that I used is a little too flexible. I'm not completely happy with the way that the gauge panel is mounted in the chrome frame and will have to look at it later. I need the gauges up and running to break in the new engine which has been sitting for 5 months too long. Another concern is dust. I'm thinking that I'll use 1/2 of a plastic ice cream bucket for a dust shield to protect the gauges. I'm thinking that a better way would of been to use the gauge set as it came out of the Cutlass wagon and put it into the dash. There's lots of room there for it. The alternative is to find a more curved gauge set and try to fit it. There's several advantages in that the factory sets are sealed from dust to start with and the wiring is done for you. You just have to wire up to the back connector. 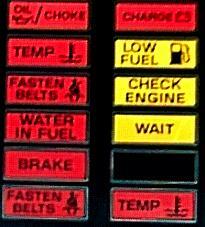 Something that has been giving me quite a headache is trying to figure out how to light the gauges. Originally, the front sheet metal bezel reflected light back onto the gauges. Basically bounced the light of the back of the front bezel and onto the front of the gauges. 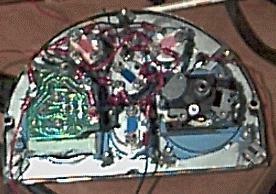 The first picture at the top of this page shows the flat black front bezel, the backside is painted a light blue color. Behind it are 12V lamps for backlighting. 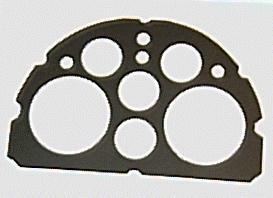 The gauge holes are punched at a 45 deg angle to reflect light. I thought that I might try something similar but the sheetmetal experts say that it can't be done without expensive dies and a 60 ton press that will stamp out the complete piece in one fast press. 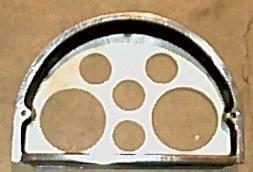 I've decided to make some aluminum trim rings to clean up the holes so that they look purdy. I did some testing and found that ordinary plexiglass transmits light very well - like a light pipe. I took a scrap piece of 1/4" thick plexiglass, beveled one end to a 45 deg angle, covered the flat sides with masking tape so that only the edges were uncovered. I shown a high intensity blue LED into the edge and voila, there was lots of light coming out the beveled edge at a 45 deg angle. So next is to make some plexiglass rings that will circle the gauges behind the front bezel and shine some blue LEDs into it. By the way, blue LEDs are very expensive compared to red, yellow and green LEDs. High intensity blue LEDs cost about $4 to $5 each. Inexpensive low intensity blue LEDs are hard to find and you can purchase them online for $0.99 at Hosfelt Electronics Inc or at 1-800-524-6464 or 1-888-264-6464. I found that the plexiglass rings didn't work as planned. The light would pass through the plexiglass but I couldn't make it reflect with any efficiency onto the gauge face. There wasn't enough room to place the LEDs on the edge of the rings so I tried to angle them in from the side. I also painted the exterior of the plexiglass with aluminum paint to keep the light inside the plexiglass. The dispersion was quite poor - hot spots near the edge where the LEDs were. I've decided to shine the LEDs directly onto the gauges. It's working quite well - actually a lot better than I thought. Positionning the LEDs so that there is a consistent illumination across the gauges is tricky but at least there is more than enough light (if not too much! ).